Wheel pose can also be called as urdhva dhanurasana or chakrasana, in sanskrit chakra means ‘wheel’, urdhva means ‘upwards’, dhanush means ‘Bow’ and finally asana means posture or pose. 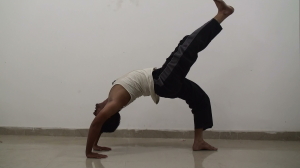 This is the why this asana is called as wheel pose. Initially before trying to exercise your chakrasana, try to make sure whether your back is compatible for this pose or not. To know this you have to exercise bridge pose which also prepares you for the chakrasana pose. Lets try to do bridge pose initially. Try to lay down your body as shown in the figure with the legs resting in forward direction. Try to connect your waist with the help of your hands, now try to bend or fold your knees ( with legs at comfortable distance ), try to lift your back with the help of your hand to the maximum level, and try to check whether if there is any pain or not, and hold it for at least minimum 30 seconds. Then calm down slowly by putting your legs in forward direction. Do this pose for atleast three to four times which actually means, you are preparing for chakrasana. Lay down your body initially as shown in the figure, now try to fold your legs with a comfortable distance knees pointing in upward direction. Now try to fix your hands right beneath your shoulders close to ears, elbow pointing in upward direction, fingers pointing in straight direction. Try to press the floor with the help of your palms and try to raise your back or hips in vertical direction to maximum height by inhaling. Make sure your elbows are straight enough when you are in full posture, if not try to straighten your elbows. Where as head dropping down in back direction facing the floor. In order to improve your pose try to put down the top of the head on the floor, then initiate your hand positions inside close to the legs, then lift your back again to full posture. Do this process until you reach to maximum close to your legs. Try to stay for atleast 15 to 30 seconds initially, after consistent practice go for atleast 2 minutes. Have a normal breath when you are in pose. Eka padha chakrasana means doing chakrasana on one leg. So when you are in chakrasana, inhale slowly and try to lift your either leg right or left to the maximum height with out bending your knees, hold it for 15 seconds the drop it slowly by exhaling. Eka hastha chakrasana means doing chakrasana on one hand. So when you are in chakrasana, inhale slowly and try to lift your either hand right or left by disconnecting the floor and try to put it on your laps or thighs with out any vibrations, hold it for 15 seconds then put back it slowly by exhaling. It is the advanced pose, it needs lots of strength and focus, it strains your body so much, so before doing these variations be perfect in chakrasana. When you want to close the pose completely exhale initially, try to put your head on the floor, then slowly dropping down your back with the help your hands, and the legs getting back in forward direction. Take rest have a normal breath or do shavasana for atleast one minute then go for other asanas. Entire front part of the body will be stretched and strengthened. Internal organs of the abdomen will be activated and increasing its efficiency. Its good for the people who work for very long hours infront your computers. Muscles on front part of the thighs and legs will become stronger. Its good for losing your weight since there is every chance of reducing your belly fat.